In order to solve the floor-to floor and interference problems, Girder-Slab Technologies implemented a research and development program. We wanted an interior structural steel girder to be placed within the plane of the precast slab units, thereby producing a thin floor construction (akin to flat-plate) with a minimum floor to ceiling height. The GIRDER-SLAB® system and the open web D-BEAM® girder technology are the result of more than fifteen years of research and development. 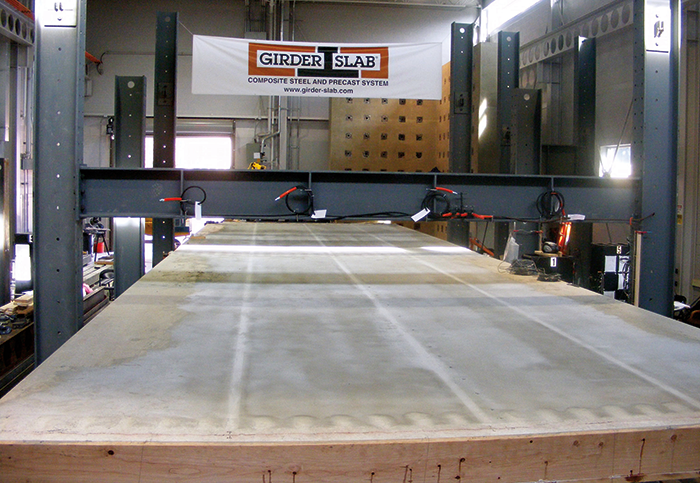 Early testing produced an ASD approach for a rational design of the GIRDER-SLAB® system. In order to develop a rational analysis that would maximize the use of this technology, extensive laboratory testing and analysis was undertaken. This included both small-scale specimens and full-scale assemblies in order to simulate actual bays. Each assembly was load tested well above code required residential live loads. The D-BEAM® girder performed without failure even at these higher loads. Recent, more sophisticated testing enabled us to develop an LRFD approach to the GIRDER-SLAB® system. Design Guide v3.3 improves upon the previously established structural and economical benefits of the GIRDER-SLAB® system. With simplicity in mind, new D-BEAM® girders have been introduced while others, less commonly used, have been eliminated. The GIRDER-SLAB® system integrates easily with lateral resisting steel braced frames, and concrete or masonry shear walls. Averaging 1.5 psf for basic floor framing on this project is extremely low, as is 7.4 psf overall. But even with such good structural efficiency, structural steel would not even have been considered were it not for the low floor-to-floor heights achievable with the GIRDER-SLAB® system. Janis Vacca, P.E., & Clifford Schwinger, P.E. 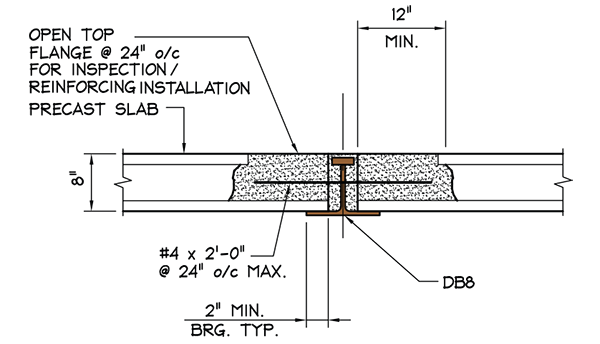 The Harman Group, Inc. Both my client and I are pleased with our choice of the GIRDER-SLAB® system. We achieved both our low floor to floor and budget requirements. The speed of erection of the GIRDER-SLAB® system enabled us to realize a construction schedule of only 16 months. Our decision to use the GIRDER-SLAB® system allowed us to erect the building in record time. The General Contractor was able to expedite the overall construction. This resulted in construction cost savings and significant early revenue generation. Our first Girder-Slab project is complete, and turned out very well. The owner is very pleased, and the structure went up quickly, with very few issues. I look forward to working with you in the future.